The USDA recently announced the availability of $25 million in grants for schools to purchase new foodservice equipment. However, even with these available funds, school foodservice directors need to be creative when it comes to equipment options. Convenience – Multi-functional equipment should be easy to switch from breakfast set up to a salad bar or full reimbursable line that you can offer outside the main cafeteria. Cost Savings – Reduce your total costs by using one cart for multiple programs; such as Breakfast Grab-N-Go, Salad Bars for lunch, and a healthy snack program. Food Safety – Make sure the equipment you purchase can safely serve, store and /or transport your food within your required allotment of time. For example is your food prepared 3-4 hours before service? Perhaps an insulated cart that is pre-heated or pre-chilled to keep the food at safe temperatures until the bell, would be a good option. Mobility – Do you have space to add new infrastructure or do you need a mobile solution that can be stored separate from where it is provides service? 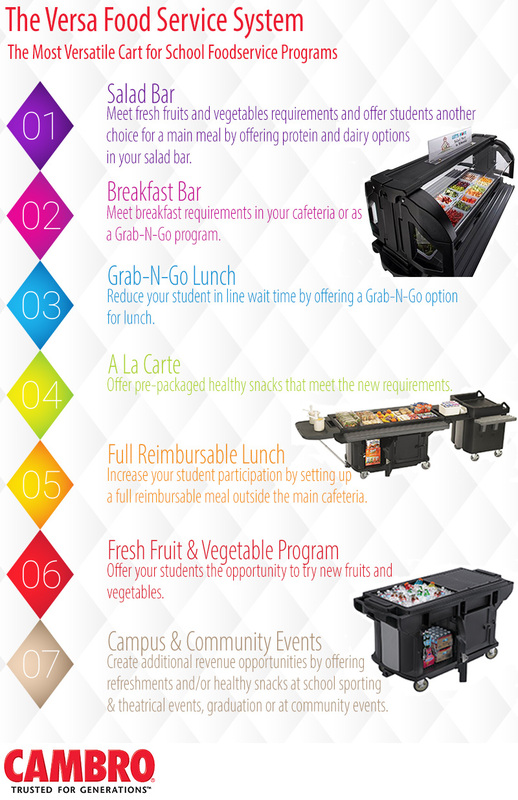 The Cambro® Versa Food Bar® Ultra Series can be used to meet the needs of 7 different programs! This versatile food bar is a vital part of any successful school foodservice program. Visit Cambro at the 2015 SNA ANC – booth 1525 to see Cambro’s school solutions and to discuss your needs with one of our school segment managers. Be sure to attend the “Secrets to a Successful Grab-N-Go” roundtable session on Monday July 13 @3:30pm. Enter to win a $200 personal food storage prize pack – click here to enter.